paperimajuri: Join Our Combined Blog Hop! Hello Crafters! 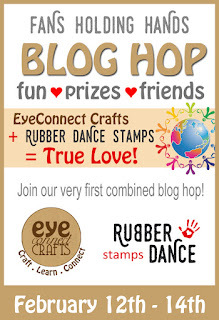 We're excited to welcome you to the very first joint blog hop with EyeConnect Crafts and Rubber Dance Stamps! Erin Sparler of EyeConnect Crafts (USA) and Bibi Lindahl of Rubber Dance Stamps (Norway) met online in the fall of 2015. They quickly hit it off and discovered that they had a LOT in common, or as Erin so eloquently put it: There is no word for old friends who have just met! 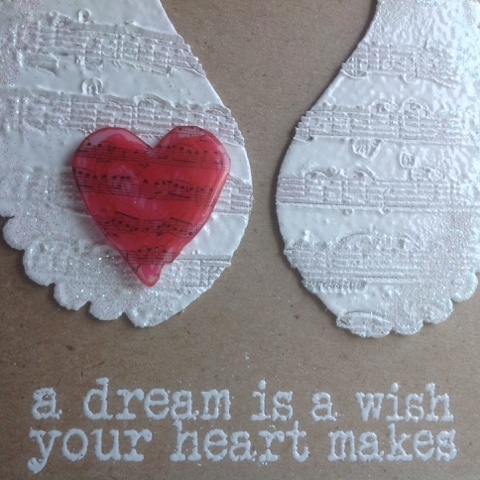 The Design Teams have been generously supplied with chipboards from EyeConnect Crafts and rubber stamps from Rubber Dance Stamps and we are all thrilled to show you the results with this joint Blog Hop. What's in it for you? Glad you asked! One lucky winner will receive a Gift Certificate worth $25 from BOTH EyeConnect Crafts AND Rubber Dance to spend on their websites! Another lucky winner will receive a surprise gift from BOTH Erin and Bibi, with $25 worth of products from their two companies! You have until Valentine's Day, Sunday the 14th at midnight EST (New York time), which is 6 am Monday 15th for those of you on Central European Time (Amsterdam, Berlin, Oslo), and 5 am if you live in the UK. You can find a time converter here. Winners will be announced 18th February. Enjoy the hop and good luck! Here's my project for this blog hop with featuring Rubber Dance Art Stamps and Eyeconnect Crafts MDF chippies. I made a very simple card, because I feel it really brings out the details of the attached pieces :) The heart is from I Heart Art. Stamped with rose red Stazon onto transluscent shrink pastic. I stamped the music stamp over it with black Stazon and after fussy cutting I went around the edges with a red Promarker. After shrinking the heart I covered it with Glossy Accents. The text is from Affirmations and has been heat embossed straight on the card blank. 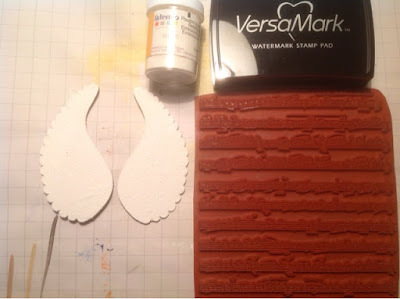 The wings have been triple embossed and stamped into. Here are some step by step pictures... I started with a pair of scalloped totem wings. The wings had a small hole for connecting them to other chippies. Since I didn't need it, I dabbed in some texture paste. If I should change something, I'd have painted a layer of white on the wings first. That way the embossing powder would have given an even finish earlier. Once the coverage was good (perhaps three layers of embossing), I added one more layer of embossing ink and powder and inked the music stamp with Versamark. I kept the stamp at hand while I heated the powder and stamped into the hot embossing. Here is the hop list, enjoy your tour! You may have noticed that the blog hop projects all use the colors from this month’s Rubber Dance Challenge, Kraft, White and Red. 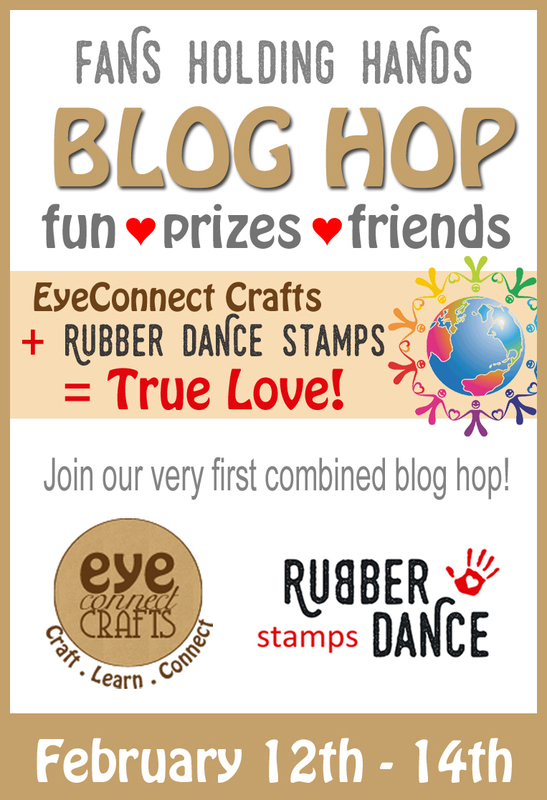 Play along for another chance to win Rubber Dance Stamps, this is the post you need to read (link opens in a new tab). Thanks for stopping by my blog. I hope you will leave a comment and join in the chance to win some cool rubber and chippies! Lovey card, Kristiina. 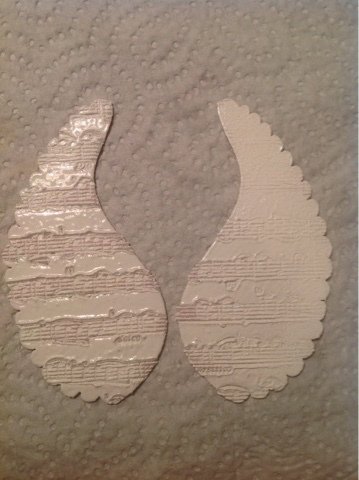 The scalloped wings from EyeConnect Crafts look so good with all that white embossing, the music notes are almost like feathers. Cute shrink plastic heart, too! sweet card with a darling heart! This is gorgeous! THE CAS design sets it off! Love how you used the wings - great job. Love the embossed wings, beautiful! Love the way the heart was made with the wings. I love the simplicity of this. Really, really beautiful. Love the variations of techniques you used to good effect. Simple an sweet really highlights the textured embossing! Cool! Simple yet such a clever designed card. Love your techniques, will try triple embossing. Beautiful wings! Love that texture! Oh, this was absolutly georgeous, Kriistina! I love the stamped, emossed wings. Thanks so much for sharing your steps! I can hear the angels sing to the heart. A Gorgeous Card. 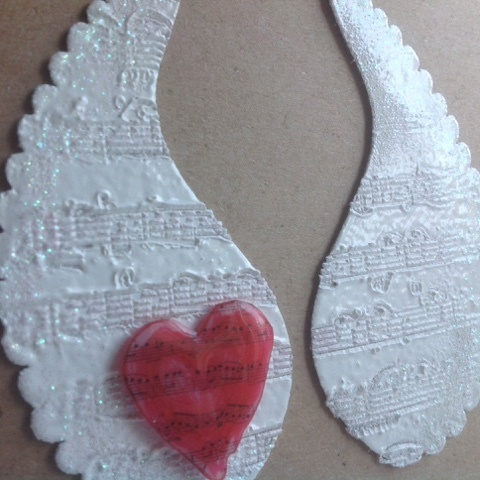 A great idea to use the music stamped into the wings. This is a lovely card. I love how you decorated the wings. Hugs, Susanne. Ahhhhhhh this is just PRECIOUSLY LOVELY. Just love that music stamp and it looks INCREDIBLE on your wings Kristiina. What a BEAUTIFUL creation. j. More amazing wings! I love how you hid the bit that didn't come out so good - I do that! This is very pretty! Love the wings and the heart!